ZPMC: Its Chairman Zhu Lianyu and members of its executive team were in Florida to inspect the progress of improvements to crane rail infrastructure. Port Everglades Chief Executive issued a second notice to proceed to begin manufacturing super-sized cranes. New Port Everglades cranes will handle containers stacked eight containers high and reach 22 across. Port Everglades' existing seven gantry cranes will be upgraded to a lift capacity of 65 tons from the current 46.5 tons. Broward County, Florida’s Port Everglades is progressing with manufacturing the first three new super postpanamax container-handling gantry cranes being built by Shanghai Zhenhua Heavy Industries Co., Ltd. Inc. (ZPMC) of China. The design phase is nearing completion, and today Port Everglades Chief Executive Steven Cernak issued a second notice to proceed to begin manufacturing the cranes valued at $13.8 million each. ZPMC Chairman Zhu Lianyu and members of ZPMC’s executive team are in Florida to meet the Port’s cargo terminal operators and inspect the progress of improvements to the crane rail infrastructure that is already underway on the Southport docks. The new cranes will have the ability to handle containers stacked eight containers high and reach across 22 containers on a ship’s deck. Port Everglades’ existing seven gantry cranes in the Southport area, where the majority of the port’s containerized cargo handling takes place, are limited to containers stacked six containers high and only reach across 16 containers on a ship’s deck. In addition to purchasing the new cranes, existing cranes will be upgraded to a lift capacity of 65 tons from the current 46.5 tons. 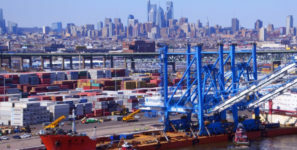 The new cranes are part of the port’s largest expansion project in its history, which includes lengthening the Southport Turning Notch from 900 feet to 2,400 feet to allow for up to five new cargo berths. Port Everglades is a self-supporting Enterprise Fund of Broward County, Florida, government. The port generated more than $162 million in fiscal year 2017 (October 1, 2016 through September 30, 2017) through fees collected from docked ships, cargo handling, real estate leases and other services. The project is anticipated to support an estimated 5,500 permanent jobs regionally when completed and fully operational.